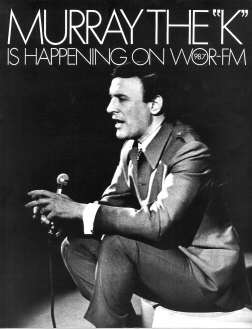 Murray The K did his first show on WOR-FM on October 8, 1966 and Mike Ferriola recorded it himself. The recording was done from a mono FM table radio using a Lafayette tape deck, so the quality is not the best, with some flutter, hiss, clicks & pops. And it was manually scoped live, sometimes ham-handedly by my 17 year old fingers. I apologize. I also did do some recent further editing to cut the file size down. 1. Murray had not been on the air on radio since he'd left WINS in February '65. But he had been on TV, which he refers to at several points. 2. There's an interesting exchange with Johnny Michaels and Scott Muni for several minutes starting at 8:00 pm (at the 27:15 point of the aircheck). 3. While OR-FM at that point was known for playing a large amount of new music, and rightly so, that didn't stop it from playing the hits...a LOT!. Twice in the three hours are The Association's Cherish and the Four Tops' Reach Out, and three times Joe Cuba's Bang Bang! 4. There was a lot of news, even on a Saturday evening a "20-20" news break at 20 after and 20 of, every hour. 5. I did leave in in their entirety a Rosko promo (14:18) and two early Stiller & Meara Great Shakes spots (38:52 & 50:14). 6. I believe the show was partly or mostly voice tracked, using the technology of the day, reels and/or carts. The key indication is the differing phase/flanging distortion of the segments of the show due to slightly misaligned tape heads as it mixed down to a mono radio, a common problem at the time. Also Murray says (3:55) "Today...later on tonight we're going to be out at Shea Stadium" for the Jets. There was a Jets game that day, though I don't know at what time. Considering that Murray was on 6 hours/day, 7 nights a week, voice tracking wouldn't have been surprising. 7. As he says. this was definitely a "shake down cruise" evening, with several mistakes, including a tape briefly rewound on air and a song played twice within several minutes. I can image one of the WOR engineers (of which I was once one) struggling to keep the order of the voice tracks/music tracks/spots etc. straight.